Before I tell you how to make an easy Valentine cake recipe, I want to mention a little about traveling with our mastiffs, Enoch and Malachi. 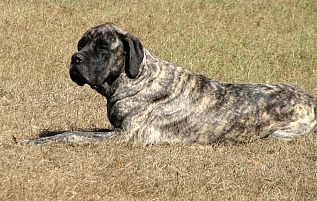 Each one of these dogs weighs about 150 pounds and finding pet friendly hotels is not easy to say the least. More and more of us are traveling with our dogs for safety and companionship. We meet a lot of these pet lovers along the way looking for Interstate 75 hotels who will welcome their animals. Like us they refuse to stay where their pets are not welcome. La Quinta hotels were all over the internet as pet friendly and that they are! We were welcomed with open arms. We have never stayed at the La Quinta hotels before and this was a very pleasant experience. The rooms were very spacious for our mastiffs and very clean and fresh smelling. The beds provided great sleeping. Our animals were all very happy and the hotel was full. Can you imagine someone trying to rob a hotel full of dogs! Not a chance! Most other hotels are cutting back on “freebies” such as breakfast. The La Quinta hotels serve a delicious and plentiful hot breakfast buffet including a great sausage gravy recipe. Not only breakfast but in the evening they host a free cocktail party for the guests. Of course, pets are not included but we did suggest a party for the animals. Many of the people like La Quinta hotels so well that they also stay with them when they don’t have their pets and I will be one. I thought this was too good not to pass on to all of you. Now back to how to make an easy Valentine cake recipe. The holiday is just around the corner and many are asking for some good ideas. 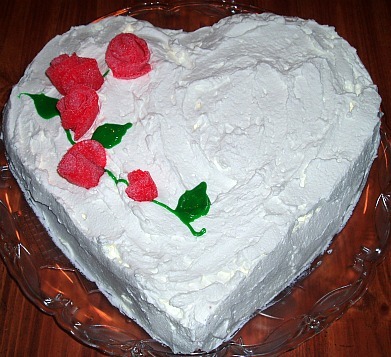 The Valentine Day cake that I am sharing with you today is a Jello poke cake. You may have made some version of this cake before but I am using a homemade white cake recipe with cherry Jello. 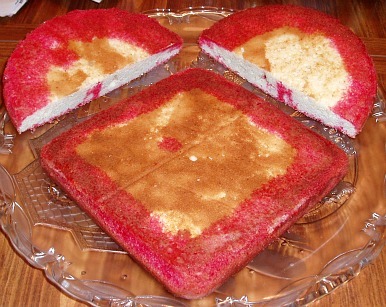 I will show you how to make a heart by baking the cake recipe in one round cake pan and one square cake pan. You can use a box layer cake mix or your own favorite cake recipe. Remove cakes from the refrigerator and loosen around the edges with a knife. Wet a towel with very hot water and set cake pans on to loosen. Turn cakes out onto a large tray and remove wax paper from the bottoms. 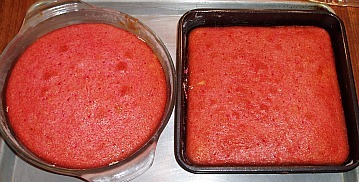 Cut the round cake evenly in half; place each half on the top flat sides of the square cake. 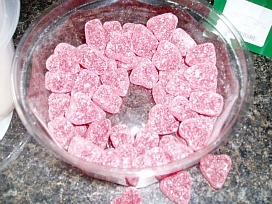 (You will see how it forms a heart). 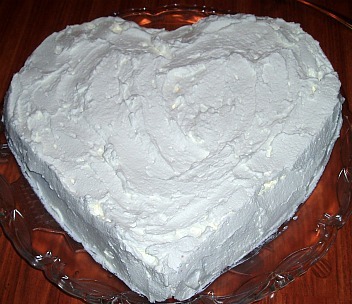 When you learn how to make an easy Valentine cake recipe you can frost it with whipped cream or a frosting recipe. 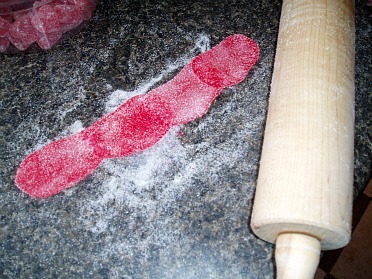 Roll candy on a sugared board one piece at a time with a rolling pin until thin and flat. Use two pieces for small roses; three or four pieces for larger roses. Lay the pieces out on the sugared board connecting them together and roll again with the rolling pin until they stick together. 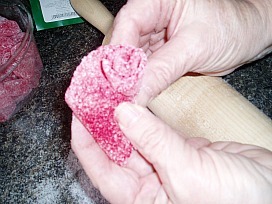 Start rolling at one end like jelly roll shaping into roses; press the bottom together in a point to hold and keep the top loose to shape rose petals. Arrange roses on the top of cake and make stem and leaves with green icing. Learn how to make an easy Valentine cake recipe with this strawberry cake recipe and serve it with berries for those who love short cake. Combine flour, baking powder and salt; sift together. 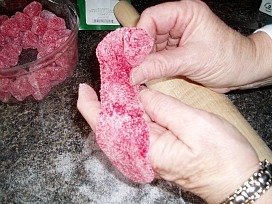 Cream shortening and sugar until fluffy; add eggs and beat until blended. Add flour mixture and milk to creamed mixture; spread in greased pan. To make topping cream together butter, flour and brown sugar. Drop by teaspoonfuls on top of mixture in pan; bake about 25 minutes or until cake tests done. To serve top with fresh sliced strawberries and cream while still warm. Learn how to make this easy Valentine cake recipe; it is a delicious extra moist pound cake to serve with raspberries or strawberries. Add eggs, flour and whipping cream beating well. Stir in the extracts and blend well. Spoon batter into a greased Bundt cake pan. Bake in preheated oven at 325F degrees for 1 ¼ hours or until cake tests done. Cool in pan for 5 minutes; invert on wire rack to cool completely. Dust with sifted powdered sugar and serve with berries.